Disclaimer: I participated in an Ambassador Program on behalf of Mom Central for the National Pasta Association. I received pasta samples and a stipend to facilitate the creation of pasta recipes as well as a promotional item to thank me for my participation. Our first winter storm officially hit. Well, should I say our first winter storm officially hit about 10 days ago and we’re now most definitely in winter, hovering in the 20s and 30s. I’m not sure if it’s survival instinct or just a love of comfort food, but whenever it’s cold outside, that’s when a nice hearty meal is the perfect dish. With the holidays approaching, I love cooking meals that embrace the comfort of home. Home-cooked dinners are a great way to bring good times and good conversation to the table and pasta dishes are perfect for those holiday gatherings. Not only is pasta easy to make, you can prepare it in a variety of dishes to fit any palate (even of the pickiest eaters,) and pasta has lots of complex carbohydrates to power your next day on the ski slopes. A few weeks ago, I shared a recipe for Roasted Garlic and Parmesan Pasta that I found on the PastaFits.org website. Sponsored by the National Pasta Association, PastaFits.org is a great pasta resource for recipes, cooking tips, and other pasta-related information. 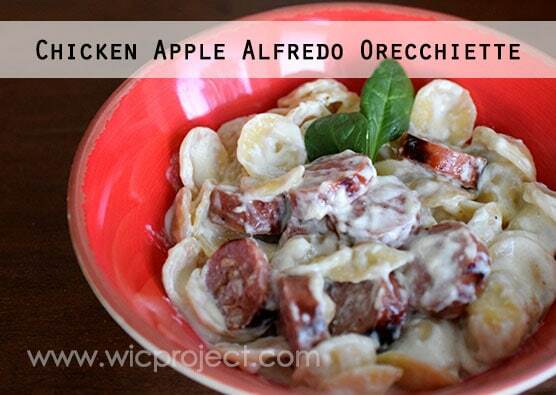 Inspired by that (healthier) recipe, I made this (not as healthy) recipe for Chicken Apple Alfredo Orecchiette. 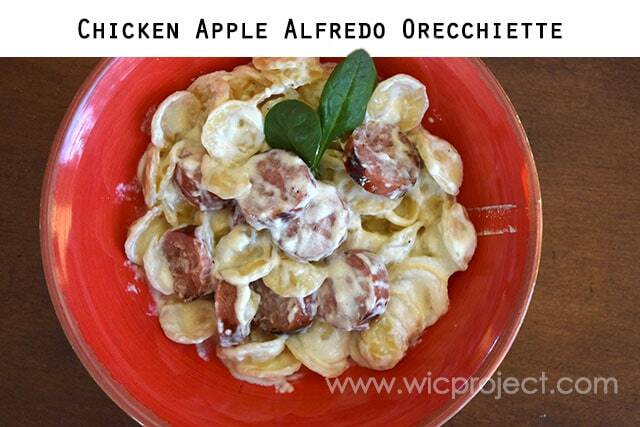 I used chicken apple sausage here but you can use any other type of sausage, even crumbled sausage. We have an indoor grill so I that’s how I cooked the sausage, but you can adjust to suit your cooking preference. If you didn’t know (and I didn’t until I looked it up on PastaFits.org), Orecchiette means “little ears”, which describes this pasta’s cupped shape. 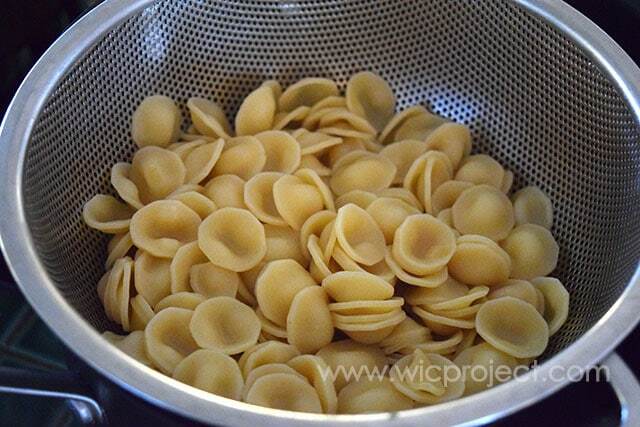 Orecchiette is great for pasta salads or hearty, chunky sauces. And tonight, Orecchiette were perfect for our alfredo sauce. I’ll be the first to admit that this is not a healthy recipe – it’s a hearty recipe. You can make this recipe a little healthier by swapping out the cream for milk and omitting the egg. You may want to add a little flour to thicken the sauce if you do. First, add the cream to the melted butter, then add the salt and nutmeg. 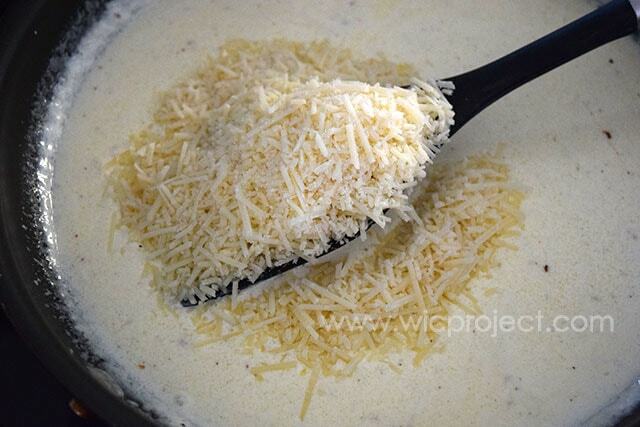 Next – CHEESE followed by the egg, then let it simmer. If you’ve timed everything right (or if you’ve planned ahead), your pasta should be about done and the sausage cooked. Mix everything in a bowl and serve! What are some of your favorite pasta dishes to enjoy during the holidays? 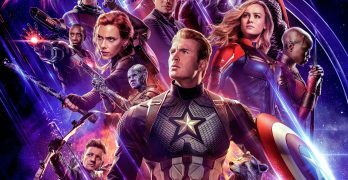 Good post, i will cool it for my family.